of Asian Pearl remains available. I considered myself very lucky to find these very high-quality mother-of-pearl marquis-shaped double drilled beads, they are just gorgeous. I couldn't wait to make a GeishaStix design with them, mother-of-pearl is just so elegant and goes with everything and every occasion! Genuine mother-of-pearl marquis-shaped gemstone beads, rare vintage Swarovski Crystal Aurora Borealis channel-set crystals, and a Bohemian crystal Aurora Borealis bicone crystal dangle suspended from sterling silver filigree at the end of this one-of-a-kind special edition Japanese kanzashi-style hair pin. 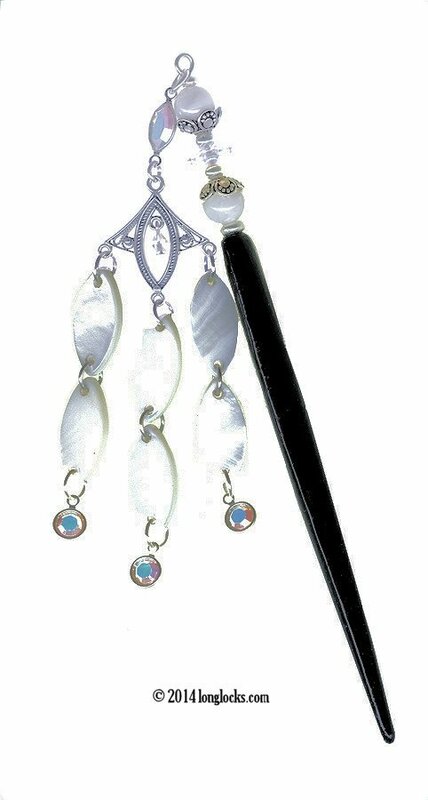 Two genuine mother of pearl gemstone beads nestled into ornate sterling silver flower bead caps, and a Swarovski Crystal Aurora Borealis margarita (flower shaped) crystal, adorn the hair stick. Silver plated heishi beads complete the hair jewelry design. The hair stick is carved bone, hand painted in satiny jet black under layers of protective clear enamel. This archived Asian Pearl LongLocks GeishaStix hair pin measures approximately 6" long from end to end (excluding dangle). The dangle measures 3" in length.